Now that the health care reform law is upheld by the Supreme Court, the 3.8% Medicare tax on unearned income for high earners is also here to stay. It will come into effect in 2013. The tax is on unearned income — interest, dividend, capital gains, etc. (Social Security, IRA and retirement plan withdrawals don’t count) — but only on the portion spilling over the threshold ($250k married, $200k single) when it’s piled onto other income. However, if your other income goes up, say you start taking Social Security or you withdraw more from your traditional IRA, it can push more unearned income over the top and subject it to extra 3.8% tax. In that case effectively your Social Security or IRA withdrawal will be taxed extra 3.8%. 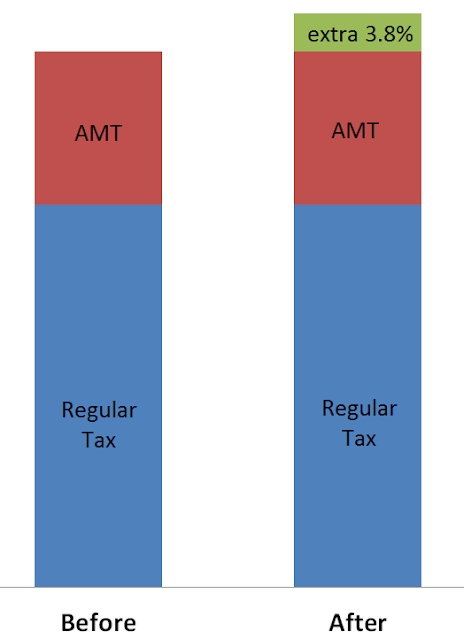 This is because AMT is defined in Chapter 1 of the Internal Revenue Code, which talks about computing your tax two different ways and the difference is AMT. The 3.8% Medicare tax was added to the tax code as a new Chapter 2A. That made it independent of the AMT. This small change also changes the nature of the Medicare tax. The Medicare tax is no longer purely a "payroll tax" because people not employed will also pay it. Employers obviously won’t withhold the extra 3.8% because they don’t know whether your income will go above or below the threshold or how much unearned income you will have. It has to be calculated on your 1040 tax return. 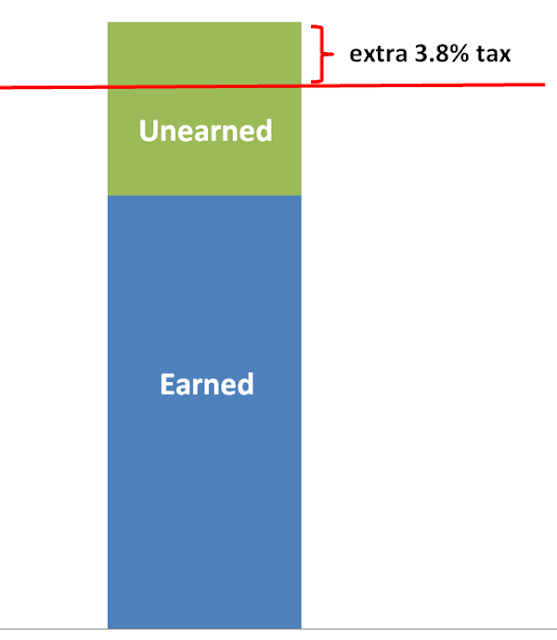 How do you reduce the impact of this 3.8% extra tax if you are a high earner? Just look at the first chart. First keep your other income low to allow more room under the threshold. This means maximizing contributions to traditional 401k, 403b and 457 plans. Second keep your unearned income low. This means favoring muni bonds interest over stock dividends and capital gains in your taxable account. Bonds become very tax efficient in a low interest rate environment, muni bonds even more so. 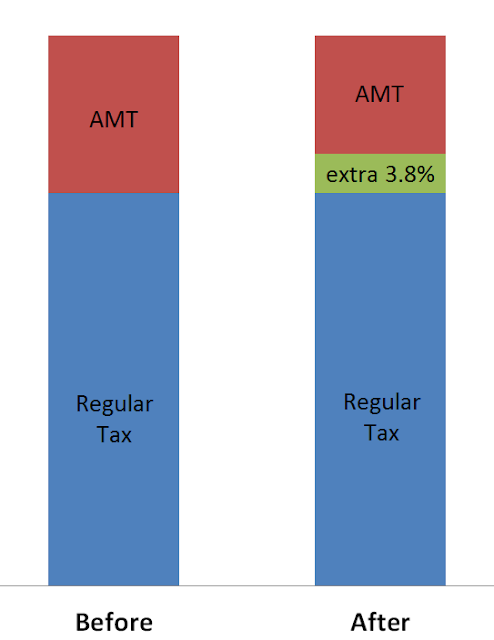 Bad news for me to hear that AMT does not absorb the 3.8%. On another point, I have always assumed that tax-free munis would not push up my unearned income so that more of it is subjected to the 3.8% tax. Is this assumption correct? And the $200k/$250k is not indexed for inflation correct? For this purpose, muni bonds interest is neither earned nor unearned. It makes muni bonds more appealing than they already are. It’s correct that the $200k/$250k is not indexed for inflation. Over time, the earned and unearned income will creep up to that threshold. It’ll have to be patched, just like AMT. Does this 3.8% affect interest from cds and TIPS bonds not held in a tax advantaged account for married couples over 250k? Sorry, I poorly understand the tax code. joe – Yes it does.